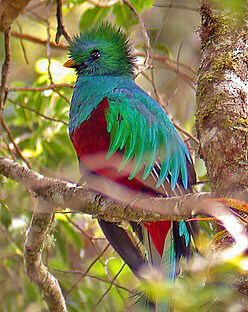 People come from all over the world to see the famous Resplendent Quetzals. These birds represent some of the most beautiful birds in the world and are found in the cloud forests of Central America, from Southern Mexico, to the Cloud Forests of Monteverde to Panama. The Quetzals are famed for their beauty and with good reason! They are brightly colored with vibrant shades, iridescent greens and brilliant reds. The males are more brightly colored than the females and during mating season the males grow two very long tail feathers that can be as long as one meter. Their heads have a crest of feathers that look like ‘Mohawks’. The Quetzal is much loved in Central America and is actually the national bird of Guatemala and they even named their monetary unit the Quetzal. The ancient Guatemalans: the Mayas and the Aztecs revered this sacred bird using the tail feathers in their headdresses. Although their numbers may be larger in other parts of Central America, they are often hard to see as many forests are inaccessible. The Quetzal is said to be easier to see in Costa Rica due to its protected forests with good infrastructure in terms of trails, roads and tours, especially in two main areas, Cerro de la Muerte and Monteverde Costa Rica. They are most easily seen when they come to the cloud forests to feed on the wild avocados that are abundant at certain time of years. Quetzals also eat other fruits, insects, wasps, ants and small lizards etc. The Quetzals live on their own as a general rule, except in mating season where they live in pairs. They often make their nests in holes in rotting trees; they have powerful beaks to make these holes. Normally the female lays two eggs; light blue in color and both the female and male take turns in incubating them by sitting on the eggs, the male will normally incubate during the day and the female at night. Both parents feed the young once they hatch mostly with insects, lizards and other small creatures such as tiny frogs. The young quetzals start to fly after about 3 weeks. The females typically neglect the young birds before they are ready to survive by themselves and it is left to the male to continue the child rearing. Unfortunately, the birds are now threatened in parts of the world, primary due to the disappearance of their tropical habitats. Costa Rica is trying to protect the habitats in national and private parks. The parks of Monteverde are popular destinations but this is not to say if you visit Monteverde you will see hundreds flying about! They are hard to spot and taking a guide with you is recommended. The guides can’t guarantee anything but they are more likely to know where their nests are and when the avocado trees are in fruit. The best time to see the Quetzals is late February to July. 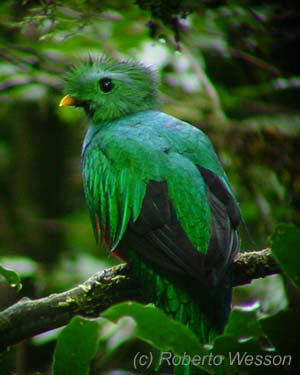 After this they migrate to lower habitats in search of food but some Quetzals always linger in the forests of Monteverde.